Meet the Super Huge Big Kahuna Water slide. This 20' Super Huge Big Kahuna Water slide is our tallest and most thrilling water slide in our party rental inventory! Great for all ages including adults. Safe and easy to climb. Our 20' Super Huge Big Kahuna Water slide is known for thrills with its height and fast paced slip. Its bright ocean colors and adorable blow up fish are sure to get attention! 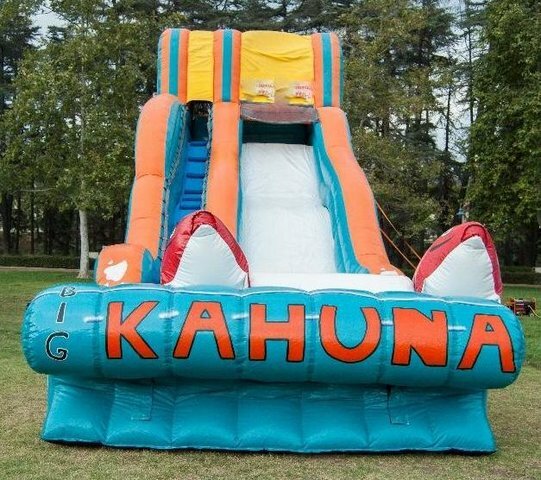 Our 20' Super Huge Big Kahuna Water slide is ideal for a number of outdoor events, including birthday parties, family reunions, Fourth of July celebrations, carnivals, barbecue, fundraisers and more. This inflatable slide will suit your outdoor entertainment needs. Huge pool and safe steps with easy grab on straps on the sides. Side of slide is pictured below.